The Sea Home is a shuttle yacht designed by the Swedish Hugo Shuber who saw its launch in 1919. 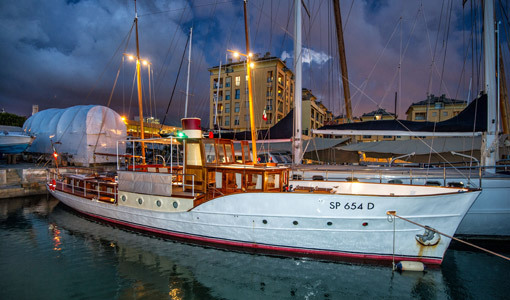 The Shipowner, for the restoration project, entrusted the Architect Matteo Picchio (www.matteopicchio.com). We asked the architect Picchio to tell us more about the the restoration project. – Specifies the works performed. “Several shipyards have been inquired and questioned, but the Cantieri Navali di Sestri of Genoa have been selected, which is the most suitable for an important restoration of this kind by virtue of their skills, their experience in the matter and for having signed the budget in line with the host’s expectations. A certain philological restoration, aimed at restoring the original splendor, keeping the spirit on which the yacht has been conceived and in line with the taste, elegance and the approach taken by the Emperor.